Flexon eyeglasses frames are known as the "Bend Me, Shape Me" eyeglasses. Marchon, one of the world leaders in eyeglass manufacturing introduced Flexon technology in 1998. The eyeglass collections bby Flexon are highly stylish, fashionable, and built to last. They are made with full rims, semi-rimless rims, and half rims with a regular hinge and a skill temple with adjustable nose pads. These eyeglasses are perfect for all adult men and women. Some models are progressive friendly, some models are not progressive friendly but every model of Flexon eyeglasses is durable, made for long-lasting style and comfort. For the best value and selection of Flexon eyeglasses are a great choice. 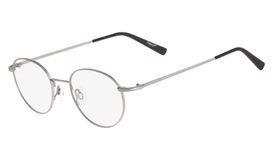 The technologically advanced memory metal Flexon eyeglasses are made with are designed to stay in perfect adjustment, they are more durable than standard eyeglass frames, they are lightweight and comfortable, they are made with magnetic clips and polarized lenses plus they are the top-selling frame in the United States. Flexon is the original titanium composite. Unlike other metals, it remembers and returns to its original shape after being bent or twisted and it is more durable, lightweight, and resistant than any other conventional metal: letting you embrace any challenge without worry or disappointment.